Leadership involves the exercise of influence in relation to common aims and enables people to work together to produce results they could not produce by working on their own. More precisely, effective leaders exercise reciprocal influence in order to engage people in action for common aims and mutual benefits in contingent circumstances. 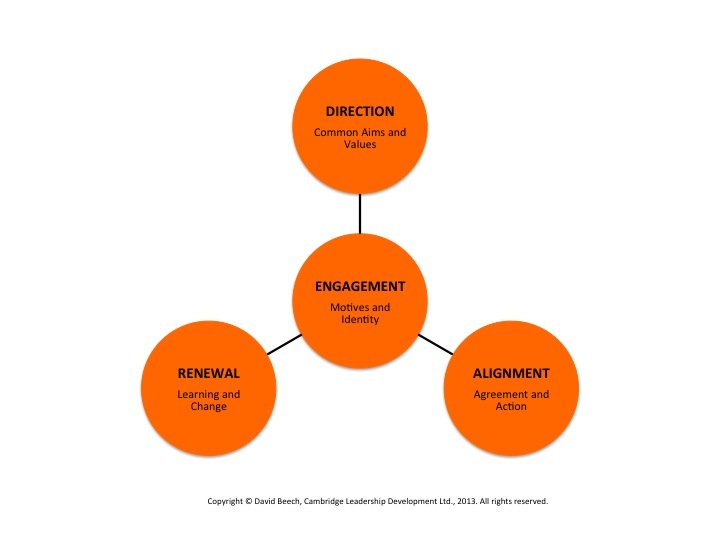 Consequently, many individuals are appointed to managerial roles with leadership responsibilities for establishing DEAR: direction, engagement, alignment, and renewal. Effective contributions in each of these four interrelated DEAR functions¹ is critical for growing revenues, reducing costs, and delivering results and innovative performance in today’s ferociously competitive, constantly changing, and unpredictable conditions. Effective leaders establish common aims and shared values that engage people’s motives and identity. Manifestly, fair pay and conditions that motivate matter, including meeting the basic human need to belong and identify with worthwhile aims and values. Communities grant businesses a licence to operate because continuous innovation in all aspects of the production of goods and services at a profit is the foundation of modern societies enabling quality of life for more and more people. Contributing to quality of life and in the process producing competitive profits are fundamental aims and values of business, as is constant renewal and innovation if a business is to survive. In addition sustainable use of resources is a fourth generic aim of many businesses and a pressing concern in many communities and nations. Worthwhile aims and values for people, profit, planet, and progress, naturally engage, energise, and inspire us. A third key function of leadership is alignment: the responsibility to align and coordinate information, decisions, and activities across the different roles and contributions of individuals and groups across internal and external networks, often on a global basis. In getting things done individuals and work teams naturally adapt in response to day to day changes in their work situation. This can be reactive adjustment to change or proactive initiation of change. The secret of lean management and agile leadership is enabling reflection by team members on what is going well, what has been improved or changed, and what could be improved or changed. This is the renewal function of leadership: the responsibility to sponsor and promote reflection on processes, results, and mental models to understand and learn from them and to harness and initiate continuous improvement and innovation, including better ways to reduce costs and to conserve and recycle scarce resources. The decisive significance of the renewal function is its contribution to entrepreneurial progress through innovations in all aspects of producing quality of life, competitive profits, and sustainable ecosystems. Renewal is fundamental to a quadruple bottom line of people, profit, planet, and progress for sustainable prosperity². Everyone has the capacity to influence other people in relation to common aims and values. Also, a division of labour increases productivity and prosperity; and with this division of work decision making authority is necessarily allocated on a hierarchical basis. The receptionist does not have the same discretion to commit company assets as does the chief executive officer, neither does the sales manager nor the production operative, nor the software engineer. Nonetheless, everyone has the capacity to accept responsibility for their contribution to achieving direction, engagement, alignment, and renewal in ways that are appropriate to their particular situation. Enabling a wide distribution of leadership responsibility within a robust hierarchy of accountability for decision making authority is a hallmark of more successful companies. As with all aspects of management and leadership this requires the highest levels of professional skill in crafting continuously changing alignments in coordinating information, decisions, and activities and in enabling continuous learning, improvement and change. Identification of DEAR leadership responsibilities (leadership functions) is a development of the seminal research of R. Freed Bales and Talcott Parsons. See Parsons, T., Bales, R.F., & Shils, E.A. (1953). Working papers in the theory of action. New York: Free Press. Beech, D. (2013). QBL: A quadruple bottom line for sustainable prosperity. Cambridge Leadership Development. Copyright © David Beech, Cambridge Leadership Development Ltd., 2013. All rights reserved.